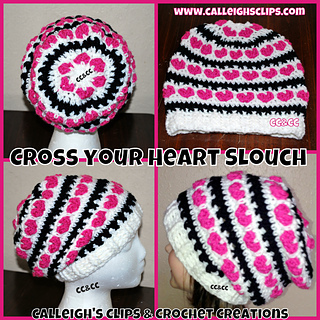 Slouchy hats have been so popular I thought a fun Valentines Day themed one was in order. These fun stitches create cross stitches for “X” and another texture for heart shapes. I rate this an intermediate patten but it’s not hard. There are two video links to help you with the stitches. Plus I’m always just an email away. I’m happy to help and usually reply right away or within 24 hrs. It’s written in 3 simple sizes. The brim has a nice stretch to it to accommodate head sizes. This can be worked up with about half a skein of each color. It’s a great stash buster. Use traditional reds and pinks or change it up to other fun hues! This pattern has been tested by my fabulous testers to ensure you have a practically perfect pattern. Do not use images for any use! Do Not copy, save, download or print! Do not use my images to sell your finished items.